Select your Star rating above in each Category and Click "Submit Your Rating" Write a Review of your Visit of Ailanto Campground. .
Ailanto Campground and Nature Preserve borders the Miravalles Volcano Protected area in Costa Rica. The Miravalles Volcano is the tallest in the Guanacaste area and from its slopes, provides water to our warm thermal pools available free of charge to all overnight guest. Ailanto Campground resides among 83 acres of exotic, ecological forest. Only 45 minutes from Liberia Airport, Ailanto lies in the midst of all the major tourist attractions and spectacular nature of Costa Rica. Enjoy a hike on our Audubon Hiking Trails. Ailanto's warm spring pools are ancient “deep Earth” sources that bubble up through the rainforest floor, bringing mineral-rich waters that have been in the Earth for at least 10,000 years. Our waters are rich in bicarbonates, calcium and magnesium, low in sulfur, and slightly acidic, qualities shared by many of the world's best springs. It's possible to observe congo and carrablanco monkeys in their natural habitat while soaking in the upper thermal pools. Ailanto Campground offers more hospitality choices than ever. We features several Hostel Houses, the private Bri Bri Suite or replica Native American Teepees,Aztec and Mayan Huts and Incan Chozas. It's a wonderful secure and safe starting point for all expeditions. Teepess, Chozas and campsites are $15 per person per night. Private Rooms in Hostel Houses are $35 per person. Bri Bri Cabin is $75 per night. Maleku Two bedroom Cabin is $100 per night. Ailanto Campground is a perfect spot for hikers, bikers, bird watchers and everyone who enjoys being in contact with Nature. 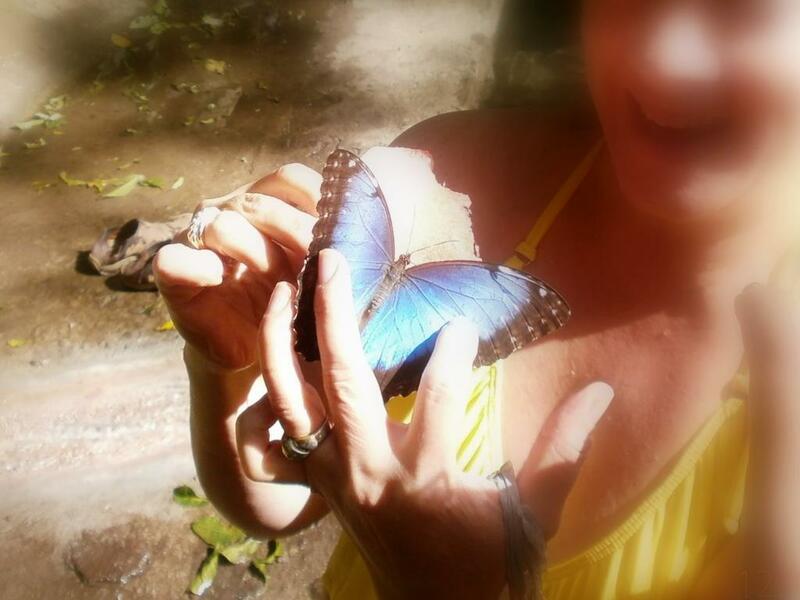 Here you can enjoy hundreds of species of butterflies while you walk around the campgrounds. Ailanto Campground is located in a biological corridor so you can observe hundreds of species of fauna, monkeys, and butterflies Tours to Zip Lines and other nearby attractons cheerfully arranged. 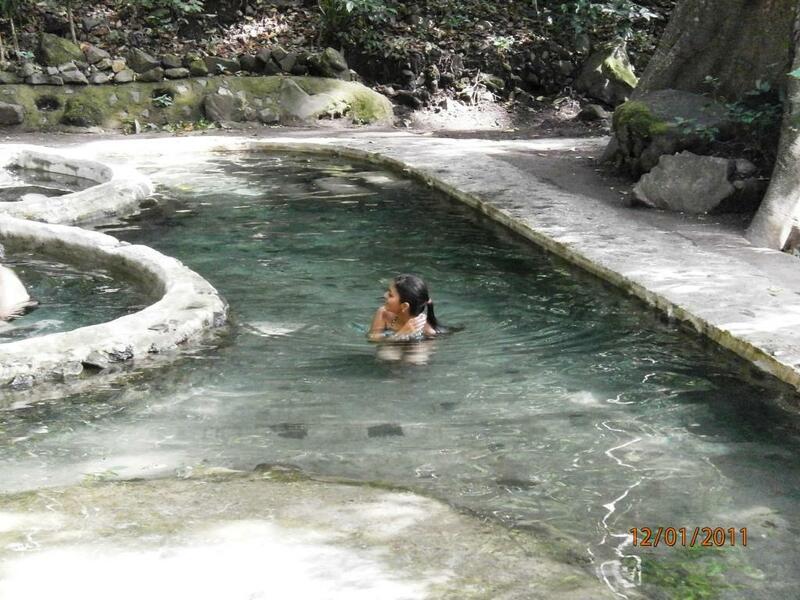 Ailanto Warm Springs is open to the public for day use of the hot springs, and most of our day visitors are Costa Ricans, so you may also meet new Tico friends. We invite you to be part of this unspoiled ecological Costa Rica experience! As we say, Come as a guest, leave as a friend. Ailanto Mountain Retreat is located within the beautiful rainforest, right in “The Cradle of Ecology”. We want to help you reach a complete balance of your body, mind and soul by combining therapies that our experts will guide you through. Come to Ailanto and leave a new person. Our version of Jurassic Park, as the name implies, is a very dense and stunningly beautiful area of primary rainforest, where you can relax in our natural thermal water pools. Soak, meditate and relish your exotic surroundings. Our natural spring carries the precious liquid kissed by our giant neighbor, the volcano Miravalles. Come to Ailanto and leave a new person. Waters here are tepid, not hot, you can enjoy the whole day there without tiring. ALL VISITORS OF AILANTO MOUNTAIN RETREAT ARE WELCOMETO ENJOY OUR THERMAL WATERS FOR FREE EVERY DAY. 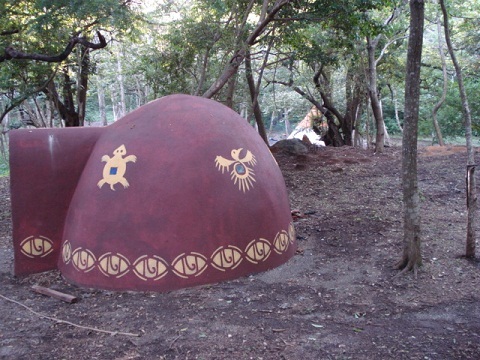 Origin of the Temazcal Tradition In the Nahuatl culture of central Mexico, the goddess of the sweat bath was Temazcalteci, "the grandmother of the baths". The cult of this goddess of the Temazcal extended throughout Mesoamerica and it is found in the other great cultures of the region, the Mixteca, the Zapoteca and the Maya. This ritual ceremony was celebrated among indigenous cultures as a therapeutic cleansing in which the properties of fire and water are combined to purify the mind, body, and soul. A renewed interest in the ancient sweat bath, still called by the name given to by the Aztecs, the Temazcal. Once again to the healing practices preserved in traditional medicine are making inroads in the mainstream. The Procedure Volcanic rock is heated on fire until red-hot in an igloo-type construction, where the participants gather. Aromatic oils and herbs are spread on the stones to create a curative vapor, heating the temazcal to even higher temperatures. The body may reach a temperature of 104° F (40° C) during the temazcal, so make sure you will drink enough water throughout your visit and afterwards. It is very important that alcohol and drugs should NOT be consumed on the day of the Temazcal. Please eat a light meal at least two hours before the Temazcal session to avoid indigestion and bring comfortable clothing such as a sarong or a swimsuit and a fleece or sweater to keep you warm when relaxing afterwards. We will provide you with towels and herbal tea. Please note that children under 12 are not allowed. Temazcal sessions will be held upon request. Private group and couple ceremonies are available too. Massages Select the type of massage that you want and free your mind from world’s worries. Enjoy a heavenly massage in one of our rainforest gazebos surrounded by nature’s sounds and a fresh breeze. Don’t worry if you fall asleep, almost everyone does. Couple massages are also available upon request. Price: $ 25 / 30 min. - $ 50 / 60 min. - $ 75 / 90 min. CRATER WALK, MUD BATHS, RAIN FOREST HIKE, FAST EDDIE: Enjoy the tranquility of Ailanto´s recreation area, take a mud bath at Las Hornillas. Lay back and let the volcanic mud cleanse and smoothen your skin. Warm showers will clean your body after this purifying experience. Enjoy a trip in our Chapulin (Hay Wagon) to the waterfalls and the deep rain forest, bring comfy hiking boots and OFF. Then jump in Fast Eddie for a quick and we mean quick water ride down to the pool below. Helmets MUST be worn. On Ailanto´s 85 acres, you may enjoy Costa Rica’s natural beauty while walking the hiking trails. Choose between an easy to an expert walk. The paths are marked by different colors to make sure you won’t get lost. We can provide you with an expert guide for a small fee. Make sure to bring your camera as you may see the many monkeys, iguanas, parrots and many animals and birds that call Ailanto home. Our Flora is just as superb; experience it when you take a stroll in our Botanical garden. The early morning and late afternoon are the best times to observe animals, but please do not feed them, they have plenty of their own food at Ailanto. HOTEL GUESTS AND RESIDENTS ARE WELCOME TO ENJOY OUR HIKING TRAILS FOR FREE! This tour can be booked as horseback riding or as a hiking tour. Our experienced local guide leads you on an exclusive path surrounded by panoramic views and Costa Rica’s stunning Cradle of Ecology right half way up of the volcano Miravalles (approx. 1100 m), where snacks, drinks, fruits and sandwiches will strengthen you for the way back. This tour is only suitable for experienced riders/hikers from the age of 14. Please book well in advance and note that this tour is non-cancelable. This tour is only suitable for experienced riders over the age of 14. Please book well in advance and note that this tour is non-cancelable. Included in the tour: transfers, snacks, drinks, fruits, sandwiches and local guide. There are few things that you can do that will give you more thrills than to float over the forest canopy. Our nearby canopy adventure center will raise your adrenaline. With 14 platforms, 11 dual cable system, a floating bridge and 1200 yards of cable above the virgin rainforest. During the tour, you will enjoy the beauty of nature and see regional animals such as white-faced monkeys in their natural habit. Don’t be afraid, the canopy is inspected and checked constantly Duration: 1.5 – 2.5 h depending on the number of participants Transfers and snacks/lunch are included in the price. This tour brings you as near as you can get to the volcano Miravalles - the only walkable live crater in Costa Rica. Walk inside the crater, watch and feel the hot steam coming out of the boiling earth. But this tour offers much more: Choose horseback or the Chapulin (tractor) to take you up the mountain where hanging bridges lead you to the magnificent and breathtaking waterfalls of the rain forest. Bring your swim suit and take a bath right under the waterfall Escondida. Return to the Volcanic Activity Center to enjoy a mineral-rich mud bath that cleanses your skin and makes you feel brand new, enjoy a hot and cool down in the numerous spa pools that dot the landscape. Ride the “Fast Eddie” the exclusive 250 yard water slide, make sure to wear the provided helmet, the speed is fast and the ride exhilarating. Duration: min. 4 hours Transfers and lunch are included in the price. Catch and cook your own Tilapia, Either come down to our lake or we take you to Villa Pez (preferably for dinner) where you can catch your own Tilapia or catfish and then our experts Fish cooks will prepare it over our wooden fires like you have never had it before. Make sure to tell them Filet if you don’t want the whole fish. Take the Interamericana 207 km towards Guanacaste, on arriving at Bagaces, go Northeast until you arrive at Fortuna de Bagaces, (21 km), go 2.6 km north towards the geothermic plant, and go 1 km east until you arrive at Ailanto Campground. it will likely be raised to the MAXIMUM peak leading you to lose LBS.